Outlook, Montana is a quiet little place, even by northeastern Montana standards ... only a handful of people, no business district left, the school closed. 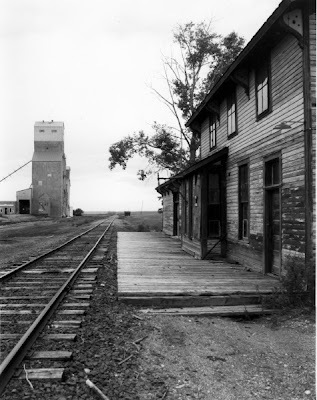 I was up there back in the early 1990s, and took this photo of the old Soo Line railroad depot there, the tracks looking west towards the forgotten towns of Daleview and Whitetail. Thank you! That was one of my favorite shots, as well ... and it broke my heart when I heard the the old depot had burned. It's pretty humbling, really, to realize how small and brief an impact man has made on much of Montana ... especially the prairies. In the greater scheme of nature, we're really pretty insignificant, and I suppose that's all for the best.